Explanation: Distorted galaxy NGC 2442 can be found in the southern constellation of the flying fish, (Piscis) Volans. Located about 50 million light-years away, the galaxy's two spiral arms extending from a pronounced central bar give it an ominous hook-shaped appearance. This striking color image also shows obscuring dust lanes, young blue star clusters and reddish star forming regions surrounding a core of yellowish light from an older population of stars. But the star forming regions seem more concentrated along the drawn-out northern (top) spiral arm. The distorted structure is likely the result of a close encounter with a smaller galaxy located just outside this telescopic field of view. 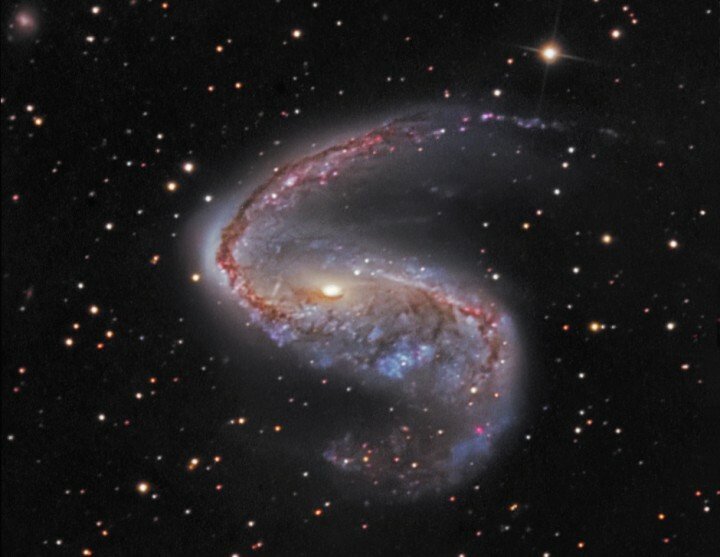 The picture spans about 1/6 of a degree, or 150,000 light years at the estimated distance of NGC 2442.